Varsityedge.com has fielded lots of questions over the years. Here are some of the more common questions we receive. How many scholarships are there for d1 football? Division 1 football teams are allowed to offer 85 athletic scholarships for their entire team and up to 25 new recruits each year. There is some discrepancy in football where teams can sign 28 players and then ask some to defer to the spring semester (gray shirt) which the NCAA frowns upon. Can division 3 offer athletic scholarships? No, athletic scholarships are only offered at the Division 1 and Division 2 level. You may, however, find a more attractive financial aid package at a Division 3 schools if you are an outstanding student and apply to colleges looking for students from your State or region to enroll. How many division 1 baseball teams are there? There are over 325 Division 1 baseball teams at the NCAA level as well as many at the NAIA and JUCO level. How many scholarships for d1 basketball teams? NCAA Division 1 men’s basketball teams can offer 13 athletic scholarships for their entire team and NCAA Division 1 women’s basketball teams can offer 15 athletic scholarships for their entire team. There are no partial scholarships at this level, you either receive a full scholarship or are considered a walk-on. How many scholarships for D1 baseball? Division 1 baseball offers 11.7 athletic scholarships per team (11.78 if you want to be technical). These can be divided up to up to 27 players in the form of partial athletic scholarships. Please note, some teams will have more than 27 players on their roster but only 27 are allowed to receive aid per NCAA rules. The NCAA made several rules changes to D1 baseball a few years ago, among them: Rosters could not exceed 35 players. The Minimum athletic scholarship a player could receive was 25%. Players transferring from D1 to D1 in baseball must sit out one year. If a player on the fall roster is receiving aid and leaves the team, the coach cannot use his aid for the spring with another player. Coaches cannot use players in the spring that were ineligible in the fall. The 25% minimum scholarship rule creates a bit of a problem because many D1 baseball teams only have a few athletic scholarships to offer because it’s not a revenue generating sport. If a team has 3 total athletic scholarships available and divides that into 25% portions, they have twelve 25% portions to use. That means up to 20 players on the team will potentially receive no athletic scholarship money at all! Can my athletic scholarship be taken away? (c) Any other athletics reason. (d) Voluntarily (on his or her own initiative) withdraws from a sport at any time for personal reasons; however, the recipient’s financial aid may not be awarded to another student-athlete in the academic term in which the aid was reduced or canceled. Do division 2 schools offer athletic scholarships? Yes, the numbers are a little lower in a few sports compared to Division 1, but they are offered. What are the new NCAA texting rules? Men’s basketball: Electronic correspondence can begin June 15th after sophomore year. Women’s basketball: Electronic correspondence can begin September 1st of junior year. Football: Electronic correspondence can begin June 15th after sophomore year. This was just changed in April of 2016 to be in line with men’s basketball. All Other sports: Electronic correspondence can begin September 1st of junior year. Texting is also allowed at the D2 level on/after June 15th of a prospects sophomore year. The NCAA D3 council voted in January of 2012 on text messaging and it is now allowed at the D3 level for every sport. What does national letter of intent mean? The National Letter of Intent or NLI is a legal document signifying the award of athletic aid at an NCAA Division 1 or NCAA Division 2 school. When you sign an NLI, you must attend the institution with which you signed for a minimum of one year. Wondering what happens if you sign and then the coach leaves? You are stuck! You sign with a school, not a coach. You an appeal to the school for your release, but they do not have to let you out of it. This might be the first important legal document you sign, so when you sign it, understand with it comes responsibility and repercussions. Can you uncommitt to a college? A verbal commitment to a college has no legal authority until a college coach offers an award letter and a recruit signs a National Letter of Intent. How do I respond to a college coach email? When can colleges offer scholarships? When you are born. Yes, we have all heard about the 7th grade phenom who already has a standing athletic scholarship offer from some college. This is nothing more than a publicity stunt and trying to get a kid excited about a school. Most of these usually fall through because kids don’t pan out or the coach is long gone from the school. There are specific signing dates for NCAA sports, and athletic scholarship offers can come before those. The offers coaches make to 7th and 8th graders are not real! Is it too late to get recruited senior year? It depends on the sport you play. If you play a spring sport like baseball or softball, it is too late to have any real recruiting impact because applications have already been sent in, and in reality, college coaches are recruiting sophomores and juniors in the spring. If you play a fall sport like football, or basketball, a strong senior season can impact your recruiting process if the college coach has time to evaluate you before applications are due. Since colleges have different application schedules, it can vary from school to school and coach to coach. Can junior colleges offer athletic scholarships? 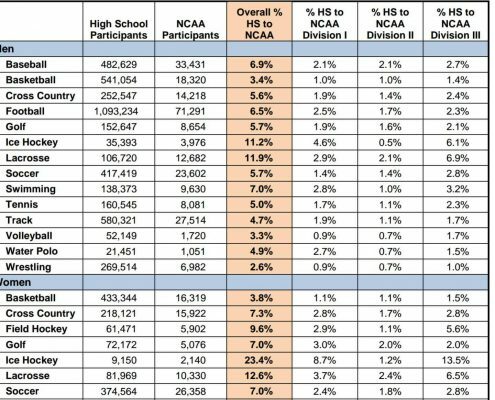 There are 3 divisions of Junior College (D1, D2 and D3). D1 can offer full athletic scholarships. D2 can offer scholarships for tuition and books but not room and board. D3 cannot offer any athletic scholarships. When can division 1 coaches contact you? When can d3 coaches contact players? When can division 2 coaches contact you? NCAA D1 – College coaches can begin to call you after September 1st at beginning of your junior year. NCAA D2 – College coaches can begin to call you beginning June 15th before your junior year. NCAA D3 – Unlike D1 and D2, there are no restrictions as to when a D3 coach can call a prospect in high school. The NCAA feels that smaller D3 schools do not have the time, money, or resources to abuse this privilege, which will often be true. Men’s Basketball Specific: In the summer of 2012 The NCAA adopted new contact rules for men’s D1 basketball. Coaches will be allowed unlimited phone calls starting June 15 after a recruit’s sophomore year. Private messages on social networks also will be deregulated. Women’s basketball calls can begin on September 1st of your junior year. Once that begins, the calls from coaches are unlimited. Women’s Ice Hockey – A college coach may call International college-bound student-athletes once on or after July 7th after sophomore year. One call per week beginning July 7th after junior year. Men’s Ice Hockey – College coaches may begin calling on January 1st of your sophomore year. Other Sports: Swimming & diving, cross country, track and field may not be made before July 1st following junior year. What is the Academic Index or AI that Ivy colleges use? As a league, the Ivy’s monitor athletic admissions via a concept called the Academic Index or AI. The academic index is not a secret, but it’s not something readily discussed by coaches and administrators. The academic index is a computed score of three components – SAT I, SAT II, and GPA (Class rank was removed in 2011 from the calculation). The minimum AI for all IVY League Schools was raised to 176 in 2011 (the max is 240). Also, the mean score at each school depends on the quality of the student body; therefore, it will vary (slightly) from school to school, so Harvard will have a higher AI than Dartmouth. http://www.varsityedge.com/wp-content/uploads/2016/04/QandA-1.gif 201 266 Varsityedge http://www.varsityedge.com/wp-content/uploads/2016/04/Logo_April_27th.jpg Varsityedge2016-04-19 14:51:092017-11-22 21:05:05What are the Most Common Athletic Recruiting Questions?